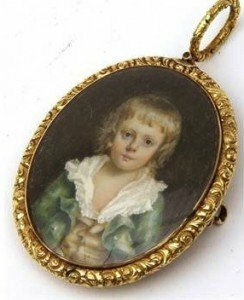 A good quality Victorian Portrait Pendant/Brooch, gold framed, oval shape, hand painted miniature of a young boy with white lace shirt, brown waistcoat and green jacket, hair panel back. 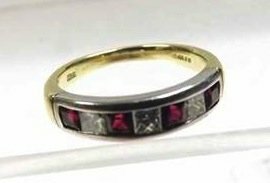 An early 21st Century hallmarked 18ct Gold Half Eternity Ring, channel set with three Princess Cut Diamonds and four Princess Cut Rubies. 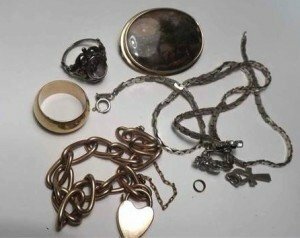 A mixed collection of jewellery, including a Silver chain link Necklace stamped “925”, Gold plated curb Bracelet with Padlock, Victorian painted panel Brooch of a river scene, Ring and Earrings etc. 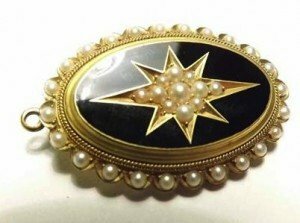 A late Victorian oval Gold Mourning Brooch with black enamelled and Seed Pearl set star centre, Seed Pearl edge. 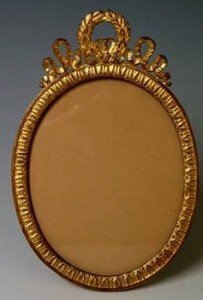 A cast brass oval photograph frame with laurel and ribbon tied top, palmette cast border, strut back. 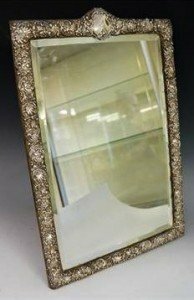 A late Victorian silver mirror frame the border embossed with scrolls and leafage the arched top with vacant cartouche, bevelled plate. 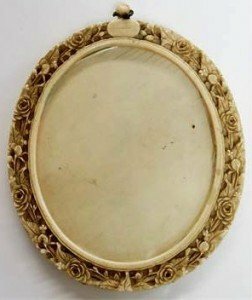 A Cantonese carved ivory oval frame the border finely carved with rose blooms and leafage, the top with oval cartouche, strut back. 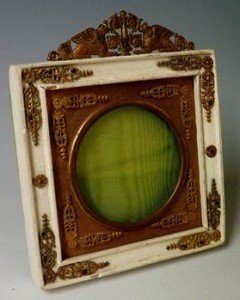 A white painted wooden square photograph frame with ormolu mounts to the angles, top with sphinx and floral scroll. 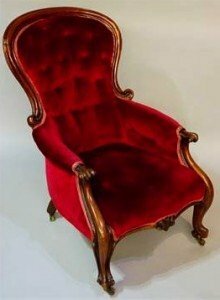 A Victorian mahogany framed nursing chair with moulded scrolling frame the buttoned back, arms and serpentine seat upholstered in crimson velvet on scrolling legs fitted brass castors. 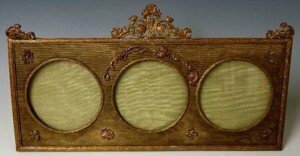 A triple photograph frame with green silk mount with cast borders applied sinuous leafage and florettes, the top with scrolling foliage to centre and ends. 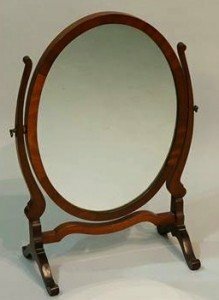 A mahogany dressing table mirror in George III style the oval plate within a cross grained frame on pair of S-scroll supports joined by a conforming horizontal rail, trestle feet. 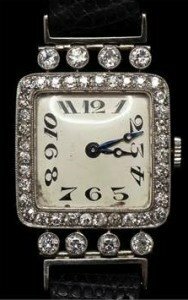 A ladies diamond encrusted wrist watch the square face with Arabic numerals within a pavé set frame, each end with four collet set circular brilliants hinged onto the black leather tapered strap. A Victorian ash shaving stand with circular plate within U-shaped brass frame supported on a turned column the cylindrical stand with pair of hinged lids on a turned column and three outswept legs. A natural salt water pearl and diamond pendant the ribbon tied foliate frame hung with an irregular salt water pearl, pearl pendant to the base, together with a fine link necklace. 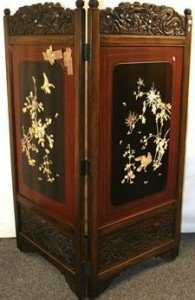 A good Japanese Shibayama two-fold screen the carved frame with dragons, birds and flower heads, the two lacquered panels with silvered bird frames, the panelled centres applied in stained ivory and mother of pearl with doves on flowering branches. 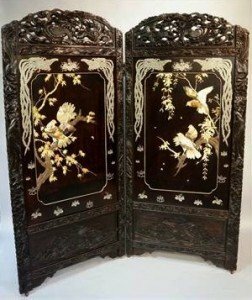 Japanese two panel screen with carved hardwood frame decorated with dragons, birds and geometric designs, two black lacquer panels in bone ivory and mother of pearl depicting birds amongst flower with painted and lacquered panels to the reverse. 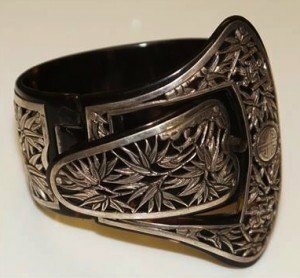 A Chinese tortoiseshell and silver belt and buckle bracelet, the tortoiseshell frame applied pierced silver panels of bamboo and figures. 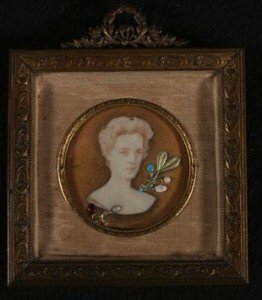 Early 20th century French watercolour on ivory miniature portrait of a lady inset with turquoise, opal and enamel cabochons, in gilt metal frame, portrait. 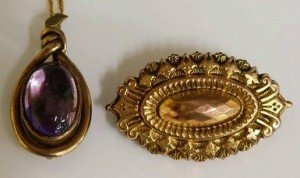 A Victorian 9ct gold brooch; a Victorian pendant set with an amethyst coloured cabochon in a twisted frame, together with a fine link necklet. 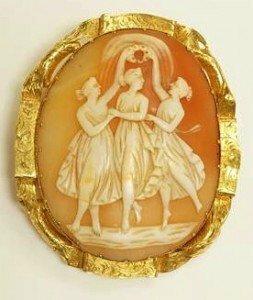 An oval shell cameo brooch the panel cut in relief with three graces within a 14ct gold foliate engraved ribbon frame.